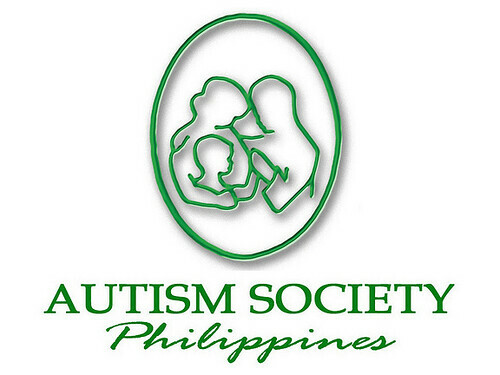 The Autism Society Philippines will be electing its 11 new set of Board of Trustees for the year 2019-2021. The Election Committee is composed of Ms. Jennette F. Rodriguez, (EleCom Chair), Mr. Cenin Faderogao (EleCom Vice Chair), Ms. Carla Banag and Ms. Abby Mendoza. Twenty four (24) nominees were evaluated by the Election Committee for the criteria set in the ASP By-Laws. While some were not qualified, others did not accept the nomination. As of today, the Elecom has confirmed the final ten (10) candidates. She brings encouragement to mothers that life with autism can be exciting, giving smiles of hope to other families. Grace has contributed to ASP in multiple capacities, most significantly as ASP’s President from 2010-2012. 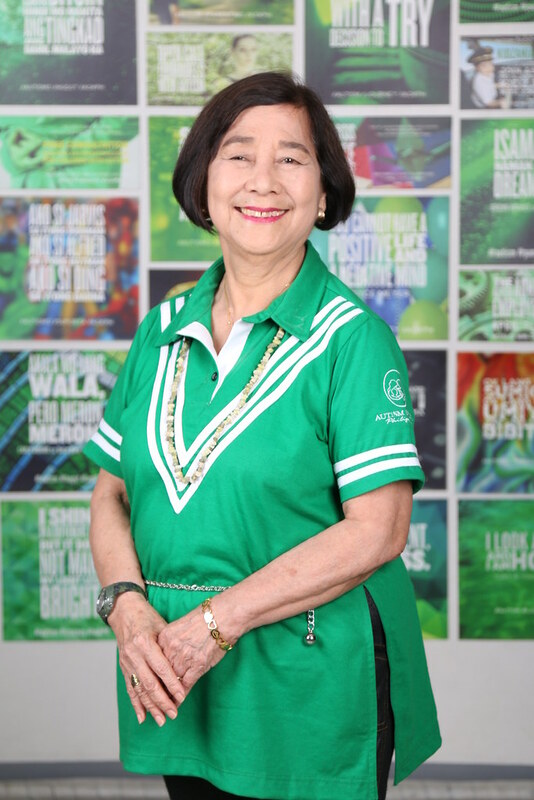 Almendrala, Carmel C. A retired ambassador’s wife and an Ulirang Ina Awardee of 2010, Carmel personifies diplomacy as she faces the world with poise, grace and intelligence. Over the years and in the many countries where their family has had to relocate because of her husband's work, she laboured tirelessly to advocate for her son Michael, now in his 40’s, and for the rest of persons with autism. Serving as Trustee for more than seven terms, she reminds young mothers of children with autism: Grab every opportunity and don’t take no for an answer. 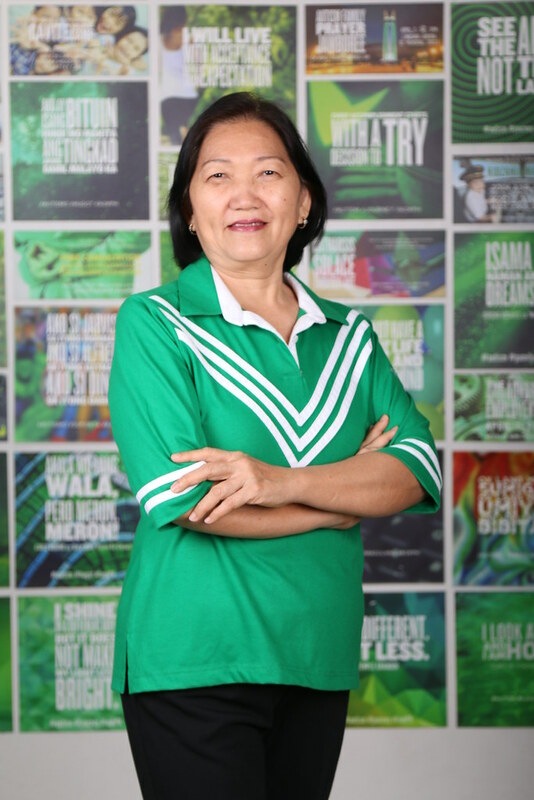 This is evident in her son Mike, who is a Special Olympian Gold Medalist (who competed in 2003 in powerlifting in Dublin, Ireland and in 2013 in bowling in Australia where he won 2 bronze medals), a 2005 Apolinario Mabini Candidate, and an independent member of the community working as an administrative staff of the Philippine Information Agency. Michael is believe to be the very 1st Person with Autism in the Philippines to earn a Civil Service Eligibility. Michael's most recent achievement is when he was chosen to represent the Philippines in the "International Conference on Disability Rights in South Korea last march 7 to 10, 2018, where 400 participants from different countries attended. Alviso, Imelda C. A former OR Nurse at Saint Luke’s Quezon City, she is a mother of 3 kids, including Andrea, a teenager in the spectrum. She is an ASP Member for 16 years now. 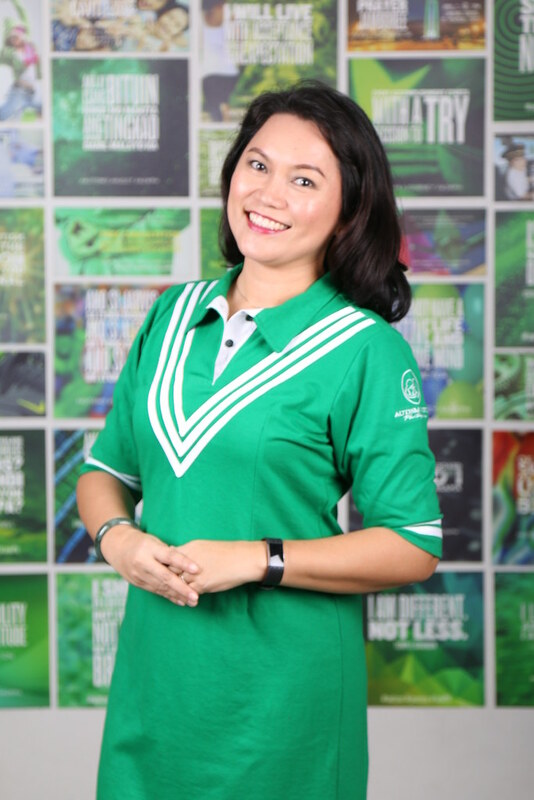 She is the former Treasurer of ASP Metro South Chapter, immediate Past President of ASP Parañaque Chapter, AAAP Team Leader, KASPI-MPC member, Microgreens Entrepreneur, Marriage Encounter Group Treasurer for 14 years now and a PWD Catholic Mass Core for 2 years. Cheng, Helen Q. is a current ASP National Trustee. 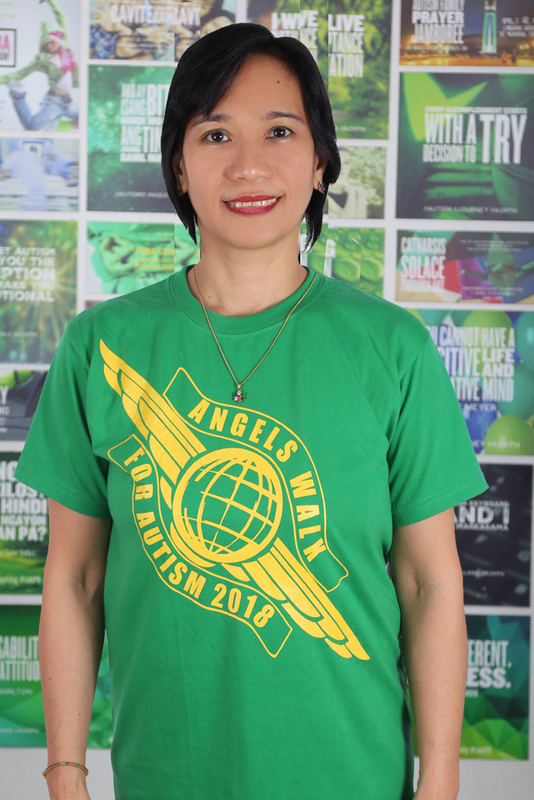 As a neophyte trustee, she has contributed a lot for ways and means during ASP major events - Angels Walk, National Autism Consciousness Week celebration, World Autism Awareness Day, and others. Her practical approach to getting things done made a lot of these events easier to execute. Helen graduated from University of Santo Tomas with a Degree of Bachelor of Science in Commerce major in Business Administration. She is currently working with her husband’s family business and at the same time a fulltime mom to her four children including Kenrick Albert, a 25 year old artist with autism. Helen's generous heart includes sharing Kenrick's talents in any way helpful to ASP. With her no-non-sense financial management skills and business instincts, Evelyn has been a valued ASP Trustee, serving as the organization's Treasurer for multiple terms. Ofrecia, Ma. Joyla N. is a mother of a young man with autism. She has been a hands-on mother and for almost 20 years, has been implementing home intervention programs along with other center-based interventions for her own son and other children with autism. She has earned her Master’s Degree in Special Education from Angeles University Foundation in 2012. She organizes seminars on autism. She also receives invititations as resource speaker from different groups for parents and teachers' training on teaching CWAs, Home Program Management and Behavior Management . She is the current president of the Autism Society Philippines City of San Fernando Chapter and an ASP National Trustee. Teacher Joy finds her fulfilment in her role as an advocate of autism and an instrument to empowering parents of children with disabilities especially autism. Ramos, Ma. Victoria. 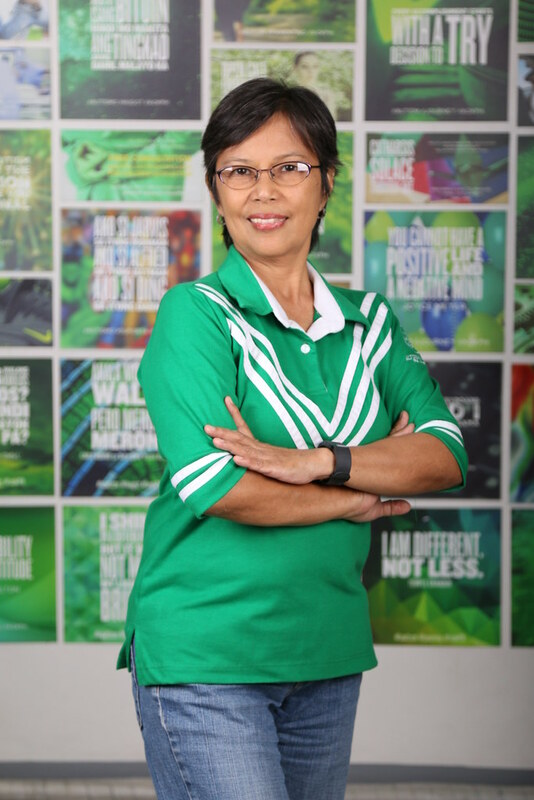 Marivic is a current ASP National Trustee and the current Vice-President of ASP Laguna Chapter. A Trainer for Work, Live and Play Program to young adults with autism at Autism Resource Center (ARC). 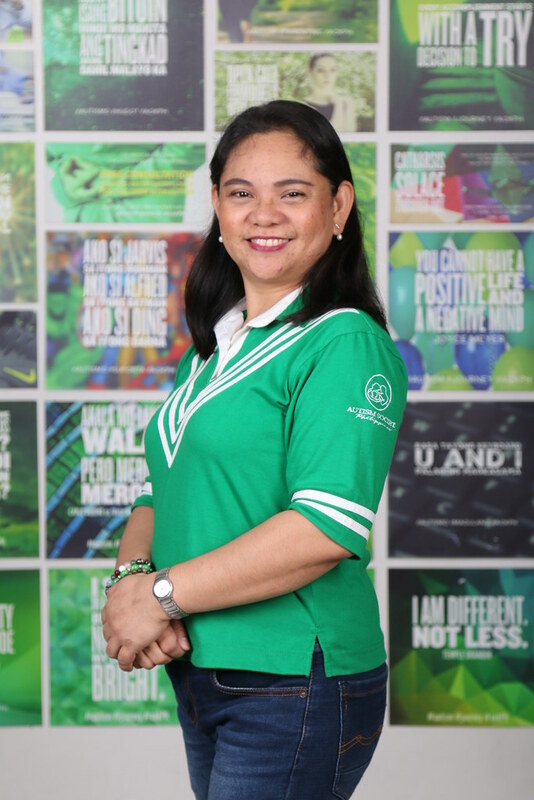 Marivic is a pillar of the autism advocacy community in Los Baños, immersing herself in special education and training and empowerment programs over the years. As an ASP delegate, she was elected to the board of the Philippine Community Based Disability Inclusive Development Association. She is a single mother to a 26 year old young adult with autism, Victor Michael "Mico" Ramos who is now working at Autism Resource Center and SM Supermarket. 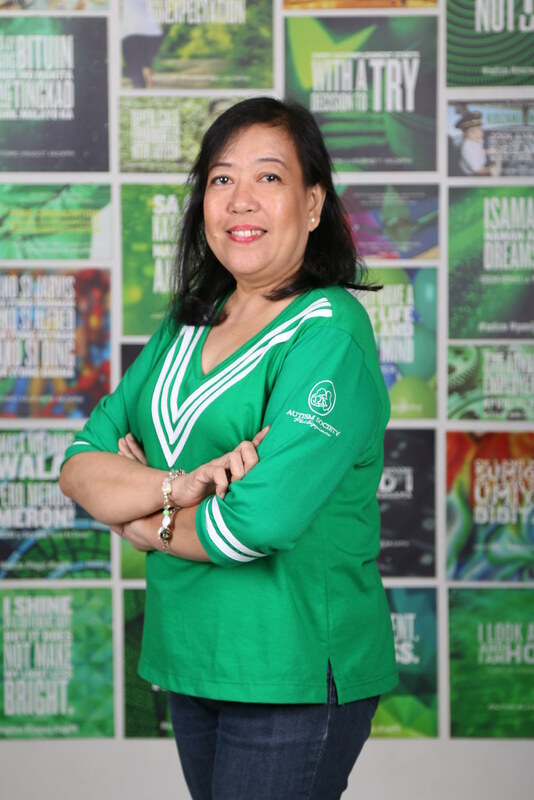 Sicam, Cecile S. is one of the 11 original founders of the Autism Society Philippines. She has served ASP in many capacities, as President from 2001 to 2004; and as its current Secretary. 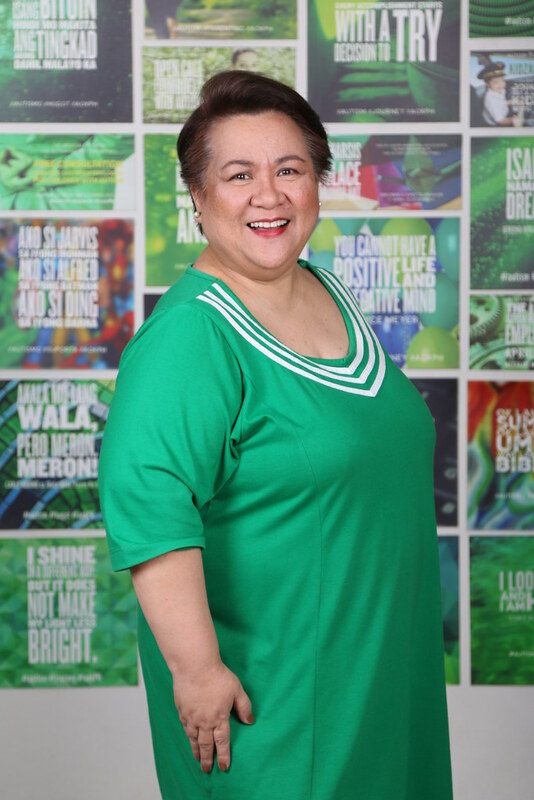 Cecile has been instrumental in the founding of Professionals for Autism Foundation, Inc., Center for Autism and Related Disorders, the Philippine Association for Behavioral Analysis. She taught SpEd for three years Santa Clara, California; and came back to serve Filipino children with special needs. She is currently one of the Program Coordinators of Bridges Foundation, Inc. Her adult son, Likas, has been employed for more than a decade. So, Perlita W. is a current ASP National Trustee. Peng juggles between being a full-time, hands-on-mom to her two gems on the spectrum, Patrick and Angelo; and, with her husband, empowering her other adult children in handling the family business. Peng has inspired many with her fortitude in guiding Patrick (who graduated from the Ateneo de Manila University) and Angelo (who undergoes functional life skills and pre-vocational training). By a fortunate stroke of serendipity, Peng was introduced to ASP and autism advocacy; and she has never looked back. Advocating for autism acceptance and inclusion has become a part of her daily agenda. She inspires others to think beyond the autism diagnosis and to enrich the lives of children with autism by gifting them with valuable life experiences. Veluz, Mona Liza M. serves as the National President of the Autism Society Philippines. 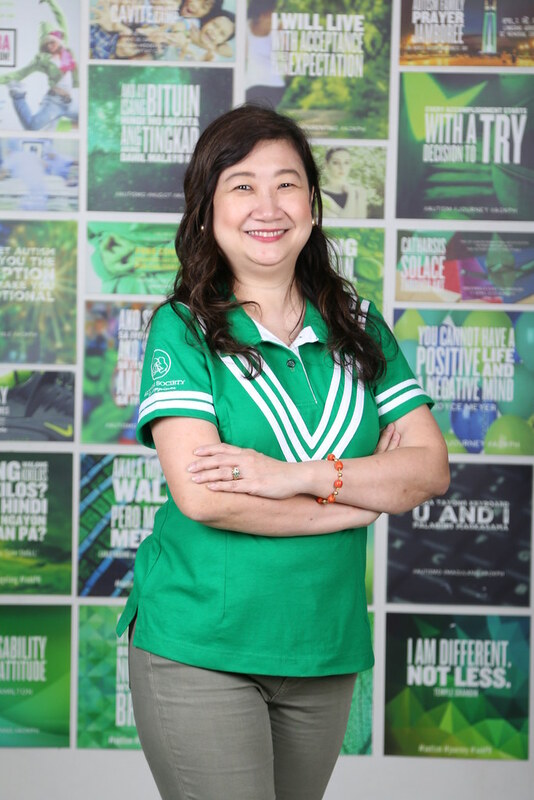 She received degrees in Business Administration, Applied Economics and Strategic Marketing from the University of the Philippines Diliman, University of Asia and the Pacific and the London School of Business. 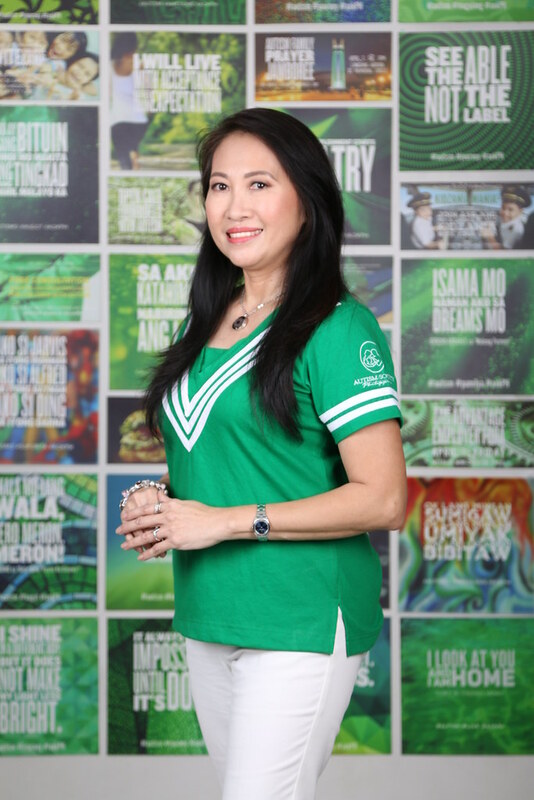 Drawing from her experience as a corporate communications and recruitment professional, she helped grow the national advocacy initiatives such as the 1Pangako, ASP Angel Corps, A-OK Philippines campaigns and the widely-successful ASP Autism Works economic empowerment initiative. She speaks publicly on disability advocacy, leadership, and genealogy. Mona is a wife and a mom to three kids. Her eldest, Carl, is an adult on the spectrum who is active in the community -- volunteering, working on his entrepreneurial ventures and finishing an architecture course. To cast your votes and for the guidelines on the voting process, click here.